This is how Lilian Taracena and her two children wound up in this valley wedged between the Siskiyou and Cascade mountains, known for its Shakespeare festival, vineyards, pear orchards and large community of retirees. 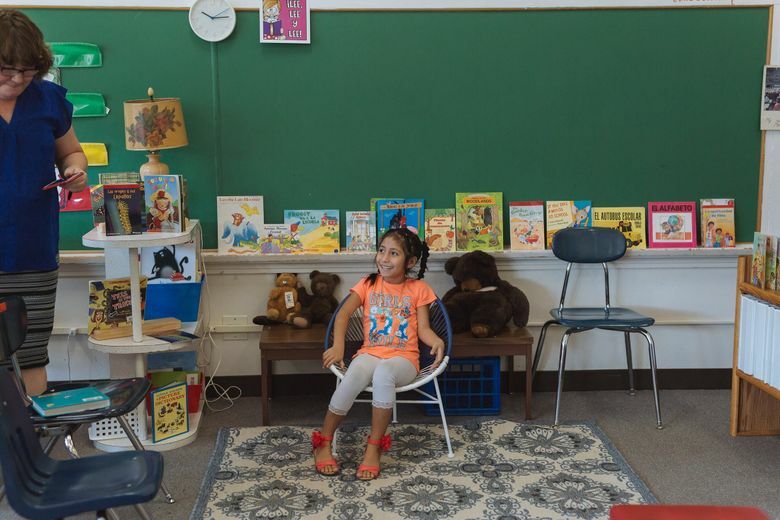 TALENT, Ore. — It was the first day of school and the fifth-grade teacher invited her students, seated in a circle on the floor, to swap summer stories in English or Spanish. One described a family trip to Spain. Another recounted a fun day at the movies. When it was his turn, José Miranda Taracena took a pass. The 11-year-old Guatemalan boy with ink-black eyes and a coy smile had spent most of his summer in a foster home in New York with his 7-year-old sister, Mayda, after immigration authorities arrested their mother near the Mexican border for entering the United States without authorization. Now the family was back together, but he was not ready to tell his new American classmates about a summer dominated by those 51 days. An estimated 3,000 families were swept up at the border during May and June in a “zero-tolerance” immigration enforcement campaign that jailed parents and warehoused their children hundreds or thousands of miles apart. After an international outcry, President Donald Trump issued an order on June 20 to end family separations. Since then, all but about 400 children have been reunited with their relatives and families like the Taracenas are taking their first steps to build tentative new lives — even though what lies ahead is far from clear. The threat of deportation looms large. Virtually all of the reunited families are in removal proceedings. To be allowed to stay in the United States, they will have to win their cases for asylum, a tall order. Immigration judges grant asylum in only about 2 cases out of 10. That is how Taracena and her two children wound up in this valley wedged between the Siskiyou and Cascade mountains, known for its Shakespeare festival, vineyards, pear orchards and large community of retirees. “It’s not easy, but I’m doing everything I can for them — they’ve been through a lot,” said the cousin, Blandi Rodas, 34, who works as a chef at a retirement home in Medford. Not all families are as fortunate. 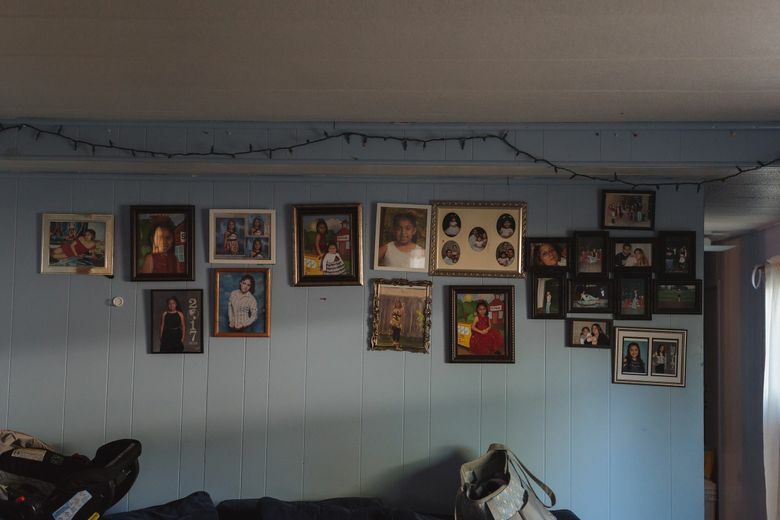 Ten percent have had to relocate because an initial placement did not work out, according to Joanna Franchini, executive director of Together & Free, a network of volunteers working with 200 reunited families in 28 states. “How much support a family gets depends on the resources of those hosting them as well as the resources available in the larger community,” Franchini said. In Guatemala, Taracena had been a quality control worker at a Chiquita banana packing house. But life in her village had become intolerable, she said. After a two-week journey over land through Mexico, she and her two children waded across the Rio Grande and into the United States on June 2, where they were detained and then separated by Border Patrol agents in Brownsville, Texas. Taracena pleaded guilty to illegally entering the country and was shuffled among several immigration detention facilities in Texas. Mayda and José were parked at a holding facility along the border with other migrant children for several days before being transferred to the foster family in New York. From there, they spoke with their mother by phone once a week. “During the first few calls, all they did was cry,” recalled Taracena, who herself had fallen into a deep depression. Taracena made contact with her cousin in Oregon, who had begun depositing money into an account that Taracena could use to buy food from a vending machine and make phone calls while in detention. 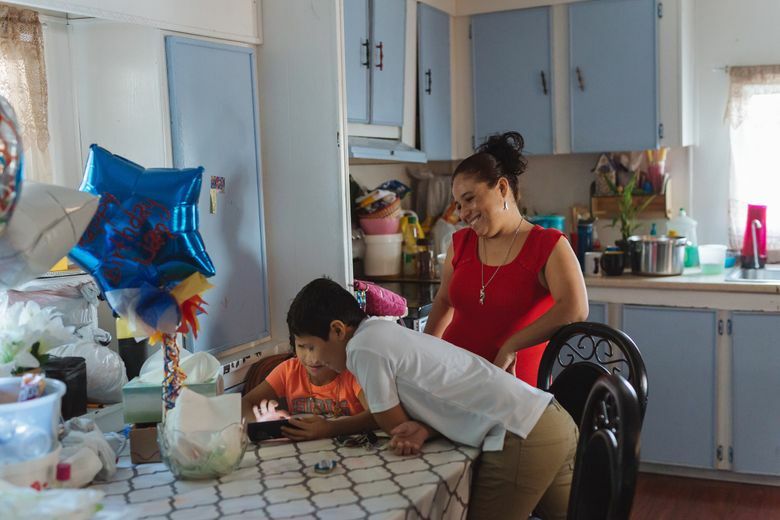 During one of the calls, Rodas, an immigrant who has legal status and has lived in Talent for most of her life, invited Taracena and her children to stay with her once they were released. The siblings rejoined their mother on July 25, the day before a court-imposed deadline for the government to reunite the migrant families. The three arrived in Talent a few days later to a warm welcome from Rodas’ gregarious 9- and 5-year-old daughters, Evelyn and Kailyn, and her year-old son, Liam, in Unit No. 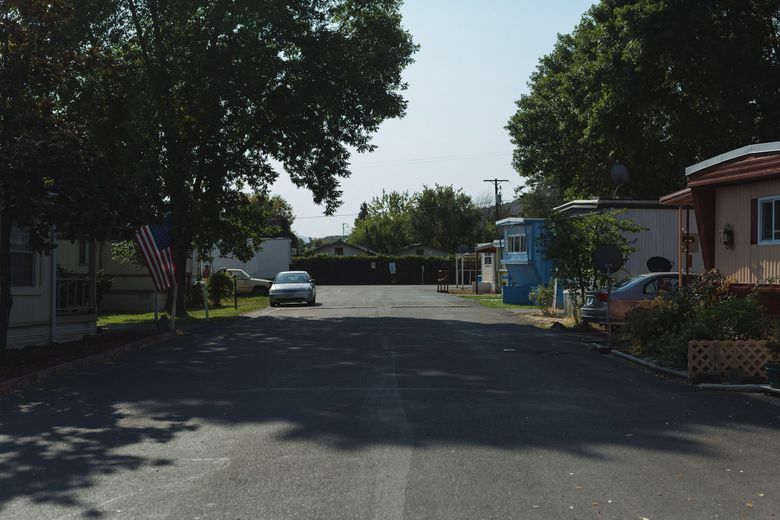 10 of Talent Mobile Estates, where many bright-colored single-wide trailers have manicured gardens and display American flags. On their first outings in Oregon, they marveled at the size of the local Walmart and the wide selection of products for sale. They dug into hamburgers and fries at Burger King and McDonald’s. But the children refused to leave their mother’s side, even to play right outside the mobile home. 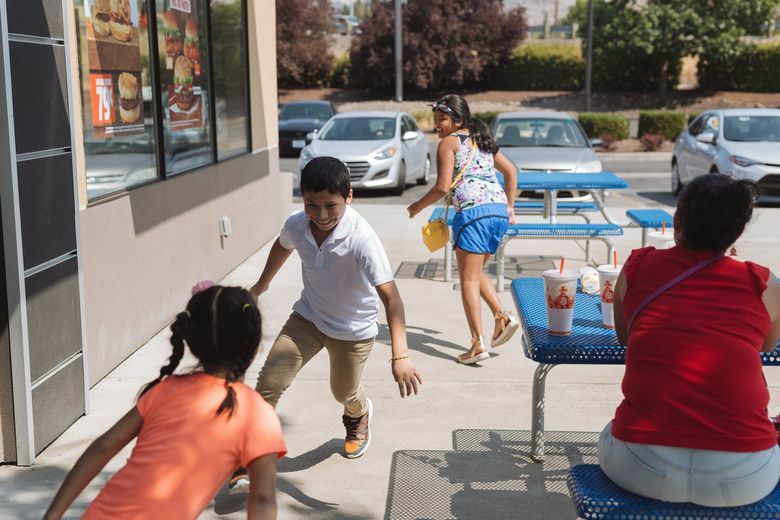 A staff member from Unite, an immigrant advocacy group, enrolled the children in Oregon’s state health plan for low-income children, which also covers children in the country illegally. Another staff member drove them to the office of Immigration and Customs Enforcement, where an official strapped an electronic device around Taracena’s ankle to track her movements. The ICE official told her she would be available by phone to answer Taracena’s questions. Federal law requires that all children on U.S. soil receive a free public education, regardless of their immigration status. Taracena registered her children for the dual English-Spanish immersion program at Talent Elementary School. 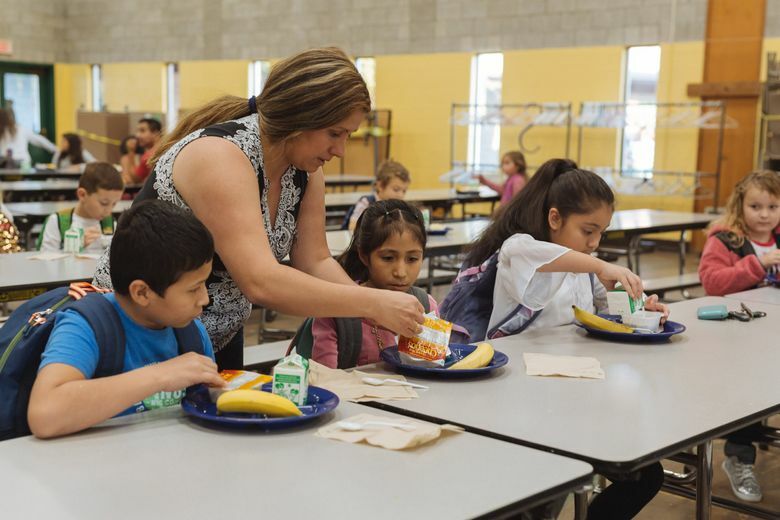 “When we heard what this family had been through, our concern for their well-being grew exponentially,” said Curt D. Shenk, principal of the school, where about one-third of the students are Hispanic, many of them children of immigrants. 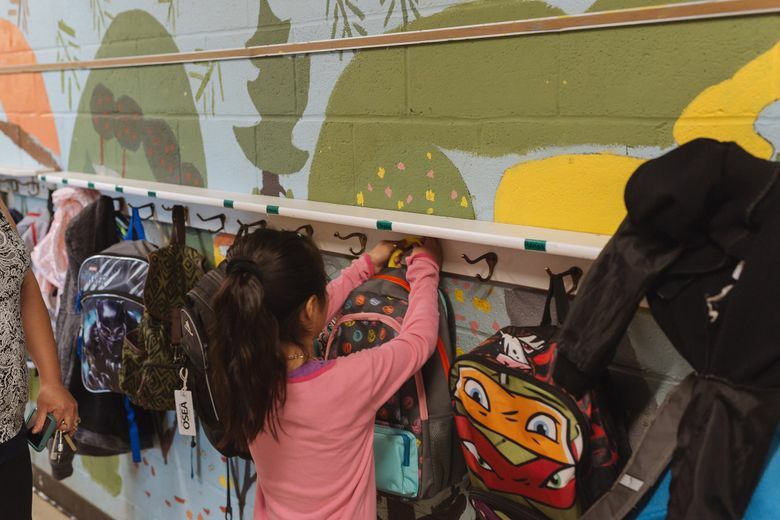 As Labor Day approached, José and Mayda embraced the back-to-school ritual of acquiring new backpacks, clothes and supplies, paid for by Rodas and a local volunteer. Mayda got pink-and-violet sneakers with blinking lights; her brother got a backpack with “Be Curious” emblazoned on it. On Sept. 4, they attended an open house at the school to get acquainted with their classrooms and teachers. Shannon Kuriyama, José’s fifth-grade teacher, rushed to hug him as he tentatively stepped into her classroom. “I am very happy that you’ll be in my class,” she told him in Spanish, eliciting a smile. “I promise it will be fun,” she told Taracena and José, who listened attentively. “If there is any problem, I can fix it.” She later showed José to his desk. 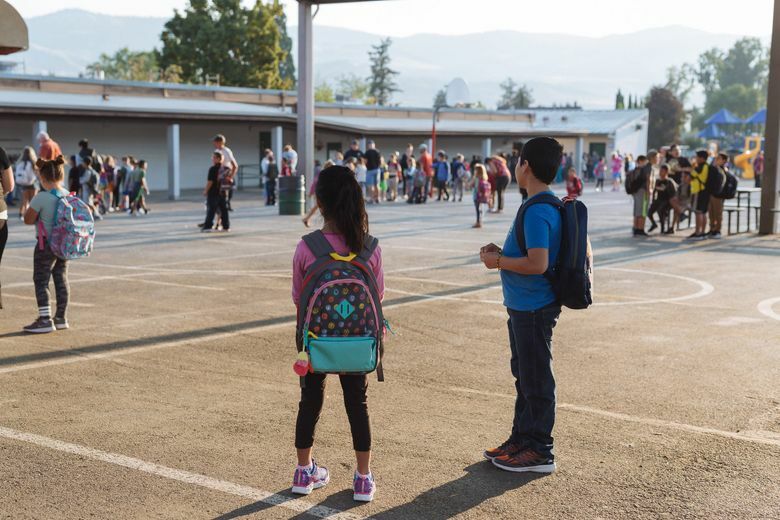 He unpacked supplies from his backpack, including earbuds for use with an iPad, which students in Kuriyama’s class use for some math, reading and writing work. By the time they left the classroom, the boy was cheerful. Walking through the airy library, he remarked on the large number of books and the aquarium under a picture of George Washington. She explained to mother and daughter that Mayda would have library days, computer lab and physical education in addition to class instruction. She handed Taracena a pamphlet with information about homework, communication and the daily schedule. When Donham asked them how they were feeling, Taracena admitted, “I’m a little nervous.” “Me too,” whispered Mayda, tugging at one of her braids. “We’re going to have a fabulous year,” Donham assured them and then handed the little girl a small packet of teddy bear graham crackers inscribed with those very words in Spanish. Later, Taracena said she had been moved by the warm reception. “It gives me great pleasure to see my children happy again,” she said. The first day of school on Wednesday was the first time the siblings were apart from their mother since they had been reunited. Sitting side by side at a long table in the school cafeteria, José and Mayda barely touched their breakfast of Cheerios and bananas. Jose’s legs trembled under the table. Mayda was fidgety. Neither child cried. On the playground, where students gathered to wait for the starting bell, they stood in silence, observing the hive of activity. In class, José was the only student without any knowledge of English and he looked lost when Kuriyama spoke in English. But she made a point of translating key points into Spanish and José carefully followed her instructions. For an exercise about what constituted being a good student, he scrawled the words, “hard working” and “studious” on sticky notes, which he placed on a poster. At recess, two classmates invited him to play soccer. Taracena knows it will take a lot to hang on to this tenuous new life. She has consulted a lawyer in Portland about the family’s asylum case, and is preparing her paperwork. A clerk who screens the law firm’s potential clients told her she should “get used to the idea that her family might have to return to Guatemala, because a lot of people will have to return,” Taracena recalled. She has not told her children.